Here's one piece of advice I'm sharing with you again, if you own a convertible with a soft top, please refrain from parking it somewhere without any surveillance. Well, it's for your own safety. You see, you might end up being one unfortunate owner whose car roof got slashed. Yes, it happened! The Audi R8 GT Spyder you are about to see in the video no longer has its proper soft top as it used to. It seems that maybe, someone envies the owner of the car for being able to afford such an expensive car while he/she can't. However, it was very unfortunate for the owner as the Audi R8 GT Spyder is the most exclusive R8 in store, there're only 333 examples of it, you know. With that being said, whoever is capable of affording such a car must have an exclusive sense of joy and pride. With the roof slashed now, it seems that there'll no longer be such a sense, or will there? Well, the owner of the car takes things easy, it seems. 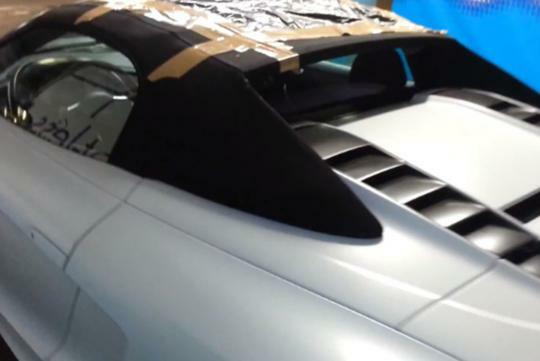 To fix the slashed roof of his super car, the owner simply counts on tapes and a plastic garbage bag! It seems that all that matters to the owner is that water won't pour into the car when it rains.